The shape of the flowers are a little different from the usual floral pattern shown in this Kamal Kadai tutorial . I adjusted a little by increasing the number of foundation stitches from the center to all sides of the petal. There's just one more block left ,but to stitch that block I need to practice my long and short stitch. I've already started with Mary's Long and short stitch lessons,but the results are not very encouraging. First of all, I didn't have the exact shades listed there, so I went with my color sense ( which could be real bad at times) .Besides,one needs to experiment,right? I did check the flickr group of these lessons to see if anyone was as adventurous as me...I didn't find any :( Most have gone with the colors mentioned in the lessons. Secondly, did you notice my mistakes? 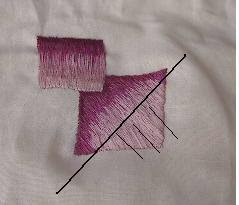 I've marked with black lines on the pic - the direction of my stitches have gone haywire (thin lines) .The thick dark line shows where I should have stitched with darker shade . Anyways,Iam off to start the next lesson - may be the performance will be better next time. See you soon, my dearest friends..
Deepa, I love this flower, especially the colour you have chosen, it looks like lovely thread. Long/short is a tough one to try and get it right... hang in there. Hugs. Don't worry for this box in Long & Short stitch. I just think it is the most difficult as any mistake is just so visible ! 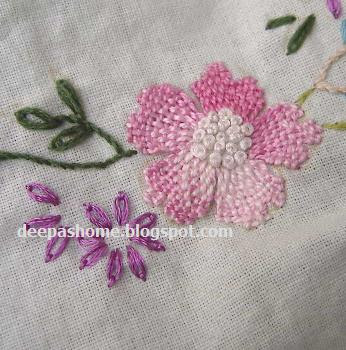 kamal kadai in this way is much more prettier.. loved it..
You have a lovely blog out here...love embroidery but its more of watching and admiring works coz always the fear whether it would turn out as well for me:) ....this blog is truly inspiring...would start putting theory into practice...bookmarked ...watching ur space for more wonderful posts. Your stitching is amazing! Love those sunny yellow flowers too, the stitching is so unique! 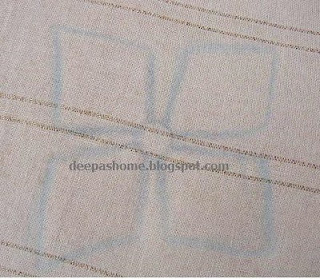 The method is same as kamal kadai,but after weaving each horizontal line we need to go down the fabric and then come up for the next line. In Kamal kadai we come up just once at the bottom and continuously weave throughout the petal. Your Kamal kadai is beautiful. I did Mary's Long and Short lessons and I managed to get shades close to what she suggested by using the DMC to Anchor convertor. The shades were off only in 2 cases... Just a suggestion. can u tell me how to make kaachika? Deepa, I just found your blogspot today and have spent the afternoon studying it. 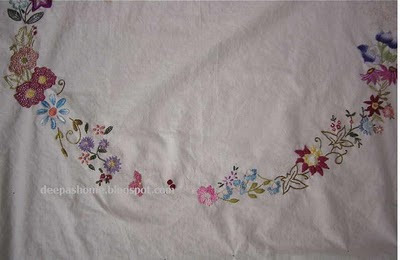 Your embroidery is beautiful! I will use your blog often as a reference for your experiments with a large variety of stitches in many threads and colors. What first drew my attention is the trellis work sunflowers. They are gorgeous. Thank you for sharing! This is very pretty! You do lovely needlework! Thank you for coming over to my blog to share in my blogoversary! A friend sent me the link to ur blog. 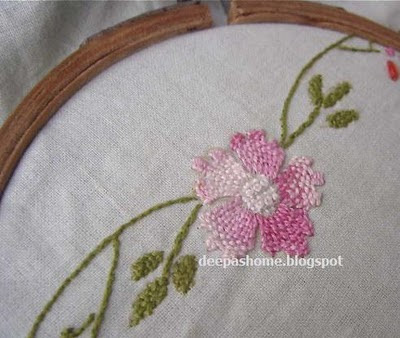 U have a lovely blog and great tutes to learn embroidery stitches which i have so far not ventured to try. Thanks for the informative piece on chikan work too. Love your blog the flower is just lovely. HAPPY VALENTINES DAY.